Also known as pitta (or fire season), summer heat can lead to excess skin irritation, acne, rashes, sweating, and even heat stroke. To keep the body cool during the summer months, ancient Indian medicine (Ayurveda) recommends consuming spices that promote cooling. Spices are one of the most potent plant foods in terms of antioxidants and bioactive compounds. According to Ayruveda’s 5,000 year old food philosophy, there are plenty of everyday spices that can even help cool the body when outside temperatures become unbearable. Here are the top 8 cooling spices, according to Ayruveda, to include in your diet to feel fresh and comfortable. 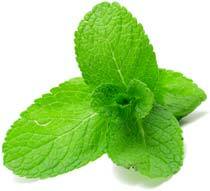 Mint is more than just a remedy for bad breath; in fact, this perennial herb is an excellent cooling spice. Picked fresh, mint makes an excellent heat-busting addition to a summer lemonade or fresh fruit salad. Growing mint in the backyard garden is easy to do; however, mint can become invasive, so it’s always best to plant in containers to avoid competition with neighboring plants. Although you may not even know what a fennel seed is, this readily available spice is thought to be highly cooling for those hot summer months. Fennel seeds also have the added benefit of stimulating intestinal juices, promoting proper digestion, and reducing acid reflux. Try chewing a teaspoon of fennel seeds before and after your next main meal. These cooling seeds also keep the breath fresh and promote good oral hygiene. Fresh cilantro leaves have been used in Thailand and Mexico for thousands of years. A staple in many homemade salsa recipes, cilantro counteracts the spicy flavors found in many international dishes. If thinking about growing cilantro, try sowing seeds in pots that receive plenty of daily light. Cardamom, another excellent digestion aid, makes a great addition to a summer morning tea. Add a dash or two of cardamom to some chilled rooibos tea laced with almond milk for a cooling iced herbal beverage. Cardamom is also delicious when added to your morning smoothie, granola, or yogurt. The striking yellow color of saffron-seasoned dishes can lift any spirit, and consuming this spice may also raise your mood. Another cooling spice that is extremely versatile, saffron is known for its prominent place in paella, curries, and rubs; it is also a great addition to tea and beverages. To make a cooling tea this summer, boil water and add some saffron powder and a couple of cardamom pods. After boiling the saffron mixture and removing it from the heat, add tea bags and steep to desired strength. Sweeten with stevia or serve as is for a refreshing twist on your summer tea. This cooling, savory spice can be used in its fresh and dried forms; however, fresh forms of the spice are often more potent in flavor. Try adding some fresh dill to many of your summer recipes to fight the heat. Grilled veggies and fish taste great with the addition of fresh dill and a dash of lemon juice. In small amounts, cumin seeds and ground cumin can be cooling for the body. Not only that, cumin may also aid detoxification  and remedy gas and bloating. Cumin is a savory spice that can be used in grain dishes, vegetable recipes, and soups. What are your favorite summer spices? Do you have a favorite recipe? Please leave us a comment below and let us know! Valussi M. Functional foods with digestion-enhancing properties. Int J Food Sci Nutr. 2012 Mar;63 Suppl 1:82-9. doi: 10.3109/09637486.2011.627841. 2011 Oct 19. Deepa B1, Anuradha CV. Antioxidant potential of Coriandrum sativum L. seed extract. Indian J Exp Biol. 2011 Jan;49(1):30-8. K.S. Muthamma Milan, Hemang Dholakia, Purnima Kaul Tiku, Prakash Vishveshwaraiah. Enhancement of digestive enzymatic activity by (Cuminum cyminum L.) and role of spent cumin as a bionutrient. Food Chemistry. Volume 110, Issue 3, 1 October 2008, Pages 678-683.